A couple of CB's and mud is all Steven needed to hit the big holes, unfortunately the tree we winched him to wasn't interested in pulling out his beefy Suzuki 700. 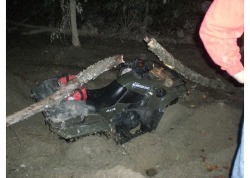 He had to jump off the bike seconds before the 40' tree landed dead on top of his bike. Unphricking believable! 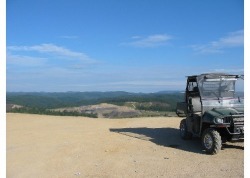 Last ride on Sunday, to the top of the strip mine. Steven and Win still had some "kah-who-nas" left to venture to the top. Stay away during the week, but on the weekends the views were awesome! Last night, Dave hit the same hole to the right and got stuck with a 4x4, it gets deeper quick, LLG wasn't sure it was the same hole, sooooo she ventures in and finds out. 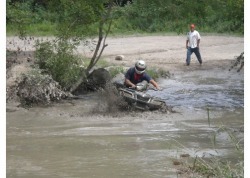 Only 20' from LLG (previous picture) Stewart slams into the same ditch (he swears he never got his shoes muddy). After this I was a bit concerned about his judgement, but he went everywhere we did and shattered my thoughts that he couldn't keep up. Stewart is the King! 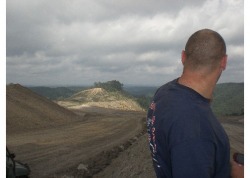 Yah we had 2 or 3 GPS's, but most of our technical decisions came from "flipping a coin", this was a smokin cool trail. 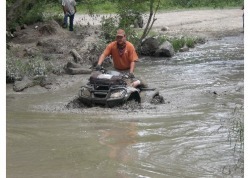 Deep water, long runs, muddy spots and no idea of where we were. 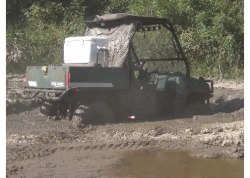 Steven is making the 1st try at a deep hole with lots of differnt tracks to take, he went hard left and was slapped with heavy mud, Stewart in the background was taking in the options for his Ranger. L/R Wins'-grizzly 700, Johns'-Polaris 700 and Stevens'-king quad 700 were as high as they could go after flying up to the top of the "mound". Stewart and the Ranger zoom to the top!